Bathroom remodel projects are one of the more popular options a homeowner chooses to upgrade. It takes work to transform a bathroom from normal to outstanding, and we want to help. ProSource® of Chicago West Loop offers dedicated account managers and professional designers to all its trade pros to collaborate and assist when making style and design decisions. 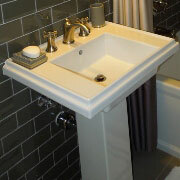 Our Chicago showroom offers a vast selection of bathroom sink options for your customer’s bathroom remodel project. You can start with a certain style like shroud, vessel, or pedestal, and then choose a color that fits the space perfectly. Not sure which sink to choose? Ask one of our friendly staff to help. 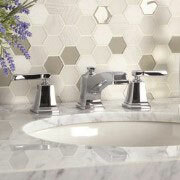 When you’re choosing a faucet for your customer’s bathroom sink, you want to match the style and design of the sink. We offer a variety of bathroom faucets from ProSource that can match, compliment, and accentuate bathroom design, style, and personality. The shower is a multi-purpose feature in the bathroom. We go there to get clean, relax, and think. So, when it comes to design and style, the shower needs to be comfortable and inviting. If you’re creating the perfect shower for your customer, you will want to consider the many accessories of a shower inside the tub such as the head, the faucet, and the handle. Bathroom space tends to be limited due to the various features we require in the room. 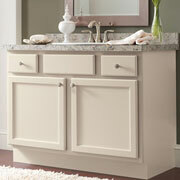 A bathroom vanity is a great choice when adding extra storage elements. Not only do vanities provide storage, but they can also include lights, a mirror, counter space, and more. Our showroom makes it easy for our trade pros and their customers to find the best products for their bathtub remodel project. 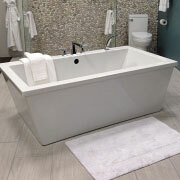 Whether you’re looking for a classic tub, jacuzzi tub, or tub-shower combination, we can help. We offer high-quality materials like stone, marble, porcelain, and fiberglass for your projects. 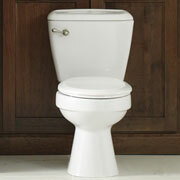 As one of the most used features in your bathroom, the toilet should be a primary focus in any bathroom remodel. You’ll find new toilets on our showroom floor to fit your customer’s needs. Not sure which throne will work? One of our friendly professionals can help.